This band has developed a following in the DC area, and this is their first CD release. This is pretty much in the neo-prog vein, with fairly strong similarities to IQ, musically, with vocals in a more "American" style. 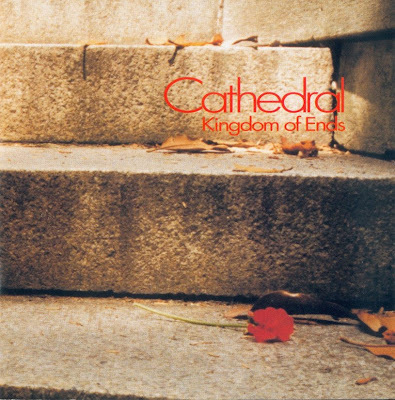 The 55 minute Kingdom of Ends consists of two previously released cassette EPs: Cathedral (1991) and Kingdom of Ends (1992). There are four songs in the five minute range and four in the 7-10 minute range. The players on this album are: Gary Sisto, guitar; Ted Thompson, lead and backing vocals; Todd Braverman, keyboards; Mike Hounshell; bass and backing vocals; and Mark Copney, drums and backing vocals. For the most part, Cathedral fall into the Genesis/ IQ/Marillion neo-prog camp but they do it very well. There are also evident Pink Floyd influences, mainly in the guitar. This is an album I would listen to as often as IQ's The Wake or Twelfth Night's Fact and Fiction. Sisto reminds me mostly of David Gilmour and a souped up Steve Hackett but on "Beneath the Wheel," he manages to sound a bit like Roy Albrighton of Nektar! Copney and Hounshell are better than the average neo-prog rhythm section. Even Thompson's voice, although nothing spectacular, is better than the average neo-prog singer, usually a major flaw in bands of this genre. Cathedral have penned appealing compositions with memorable melodies. The longer tunes, such as the eight minute "Psychotic" or the ten minute "Pinocchio" have several sections of tension and release that give the songs direction and purpose. They are doing more than going through the motions. Even the shorter tunes, like "Seldom Seen" and "Nothing About Nothing" manage to provide a few change-ups to keep me interested. Occasionally, some of the complex passages sound slightly forced but I give them credit for trying. Ultimately, however, Cathedral are derivative and provide nothing new or fresh, a trait that keeps them lumped with the other neo-prog bands. As such, Cathedral stand head and shoulders above most others in this genre. thank you very very much, my friend.